It is the classic dilemma for data centers – move or renovate? When technology moves a mile per minute and everything from applications to infrastructure is constantly evolving a data center must evolve along with it or it will find itself outdated, inefficient or in need of a move. But, how do you know when it is time to renovate? It is important for data center managers to keep a good grasp on energy efficiency and infrastructure with a well functioning DCIM plan. This way, data center managers will be ahead of the game and be able to anticipate major problems before they even arise. Moving a data center is a major undertaking so watch out for the signs below and consider renovating your data center rather than moving. Data centers are nothing if not technologically driven so if the technology in a data center is behind the times it is bound to create a variety of problems. From issues with application compatibility to infrastructure compatibility to all-around inefficiency a technology lag is a sure sign that it is time to renovate a data center. One of the biggest problems that any data center can run into is a lack of space. Unfortunately, this happens all too often. You add a rack here or there, some more infrastructure and all the sudden you realize that you have run out of space or will very soon. You are faced with the classic data center dilemma – renovate or move? Moving is incredibly costly and tricky while also trying to maintain uptime. So, rather than move, many data centers should consider renovating so that they can continue to use their existing location while increasing their usable space. If you feel like you are walking on the surface of the sun while you walk around in your data center that is probably a big red flag. And, if this is happening you are probably noticing that energy consumption and thus, energy bills are increasing. When you have not implemented proper heating and cooling techniques for your data center to ensure the most energy efficiency possible it is time to stop what you are doing and do so. Data centers have a lot of server racks and server racks generate a lot of heat. Without proper cooling solutions and energy management a data center will not run properly so the sooner you renovate to improve heating and cooling the better. 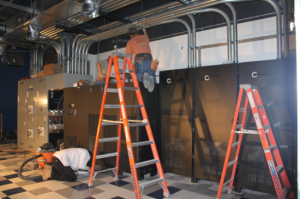 This entry was posted in Data Center Construction, Data Center Design, data center maintenance, Facility Maintenance and tagged computer room construction, computer room maintenance, data center design, data center maintenance. Bookmark the permalink.